Surround yourself with the dense woods of Coorg, indulge in a day full of adventures on the rope course and spend a peaceful night inside dome tents. At a scenic campsite in Coorg, you can spend a relaxing holiday at leisure with beautiful views of aromatic coffee plantations. For a touch of adventure, try your hand at activities like zip lining, lake crossing or the Burma Bridge. At night, you can gather around a crackling campfire, with your friends or family, and enjoy a peaceful night under the stars. Located near the town of Madikeri, this campsite is surrounded by the flourishing hills of Coorg, sprawling plantations of coffee and landscapes painted green with trees all around. 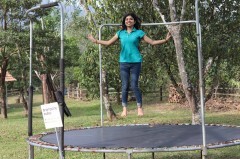 Located close to the tropical mountain slopes of the Brahmagiri Wildlife Sanctuary, the campsite is a great place to spend a relaxing holiday with your friends or family. Camping in Coorg is one of the best ways to explore the pristine natural delights that are so characteristic of the hill-station. For an authentic experience, you'll stay in dome tents that are equipped with sleeping bags and mattress. • Spend the day with gorgeous views of Coorg's forests. • Try your hand at rope course activities like the Burma Bridge. • Gather around the evening bonfire with delicious snacks. • Sleep in dome tents pitched with scenic views of the hills. Camping in Coorg is a non-strenuous activity. However, if you have heart or blood pressure conditions, and spine or knee problems, respiratory problems like asthma please consult your personal physician before booking this trip. For cancellations made 6 days or more before check-in date of the Coorg camping trip: 80% refund. For cancellations made less than 6 days before check-in date of the Coorg camping trip: no refund. All refunds are processed after deducting a transaction fee of INR 200 per person. This fee is charged by The Great Next. Check-in and check-out time at the campsite is 11:00 hrs. Bookings for children below 5 years of age are complimentary. Bookings for children between the ages of 6-10 are charged at a discounted rate of INR 1,000 per person. Bookings for children older than 10 years of age are charged at full price. Electricity at the campsite is only available in common areas. Travellers are requested to carry a torch (with extra batteries) for ease of access at night. 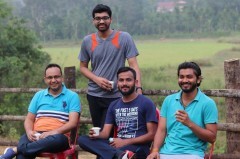 The tour operator takes utmost care to ensure safety of the travellers and shall not be held responsible for any mishap or accident during the Coorg camping trip. There is no pick-up for this Coorg camping trip. There is no drop-off for this Coorg camping trip. Day 1 of camping in Coorg: Check-in and enjoy! Arrive and check-in the serene campsite in Coorg any time after 11:00 hrs. After a delicious lunch at the dining area, you can enjoy the scenic delights of the camping grounds with a short walk among the coffee plantations. Alternatively, you can also try your hand at adventure activities like zip lining, lake crossing or the Burma Bridge. Outdoor games like playing volleyball, jumping on the trampoline, shooting darts and playing table tennis are also fun. In the evening, you can gather around a campfire with your fellow campers and enjoy the peaceful night. After a hot dinner, you can call it a day in your tents. Overnight in tents at the Coorg campsite. Surrounded by sprawling forests and plantations. Wake up early to enjoy misty, morning breeze. Go on an energizing walk around the campsite. Post breakfast, you'll check-out of the campsite before 11:00 hrs. Depending on availability, you can also extend your stay at the campsite. Your trip ends here. Personal expenses such as gear, apparel, extra meals etc. Overnight in tents at the Coorg campsite. Check-in time at the campsite is 11:00 hrs. You'll be accommodated in dome tents on a twin-sharing basis. The tents come equipped with a sleeping bag, mattress and clean linens. Today's meal package includes lunch and dinner, which usually consists of parathas, poori bhaji, a chicken preparation, a paneer preparation, cutlets and a sweet dish. You'll also have evening snacks, which usually consists of a chicken preparation, chips and bhajjis. Spend the night in dome tents. Today's meal package includes breakfast only, which usually consists of idli, sambhar, upma and an egg preparation with coffee/tea. Check-out time at the campsite at 11:00 hrs. The campsite, located near Madikeri, is accessible via road. You can hire a private cab and travel to the campsite, 135-km/3-hr drive from Mysore and 280-km/6-hr drive from Bangalore.